There’s a ton of Marv Newland news in the hopper. 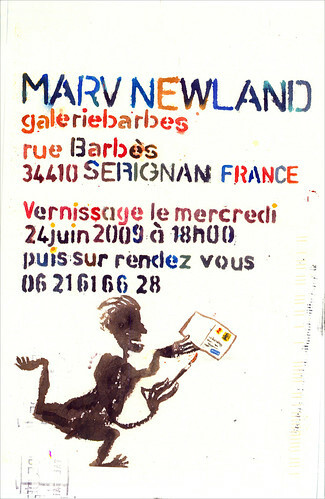 Tomorrow night, Marv’s got a gallery opening of postcards in Serignan, France. 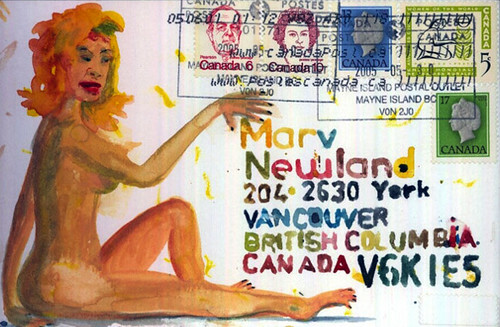 If you can’t make it, you can check out some of the cards at his Marvcards site (and those who know Marv best can marvel at the fact that there’s a website!). 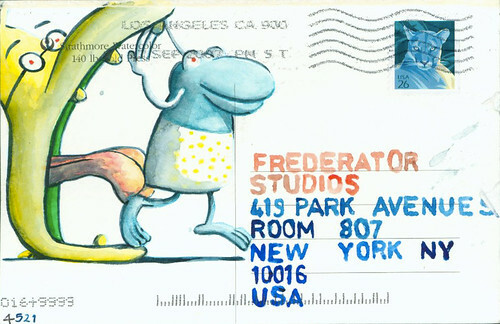 We’ve mentioned before that Frederator was producing a short film of Marv’s over the last couple of years, and, lo and behold, the subject matter is… postcards! Well, Postalolio is finished (complete credits are below the fold) and started it’s festival run. It started at the Edinburgh International Film Festival this past Saturday, and continues on to Brazil’s Anima Mundi Festival throughout July. 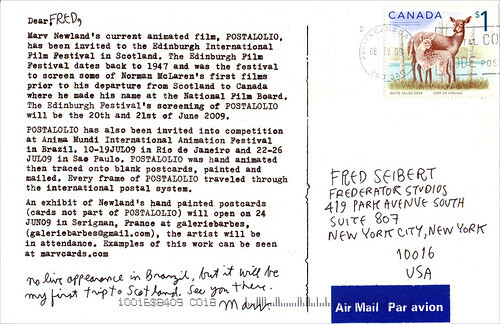 Postalolio (sample #1), by Marv Newland from fredseibert on Vimeo. I wanted to give a taste of what you’re missing, and assure you I’ll let you know the rest of the worldwide screening schedules where you might see the film yourself in person. We just got the sad news that our old friend Jaime Diaz passed away this Saturday. 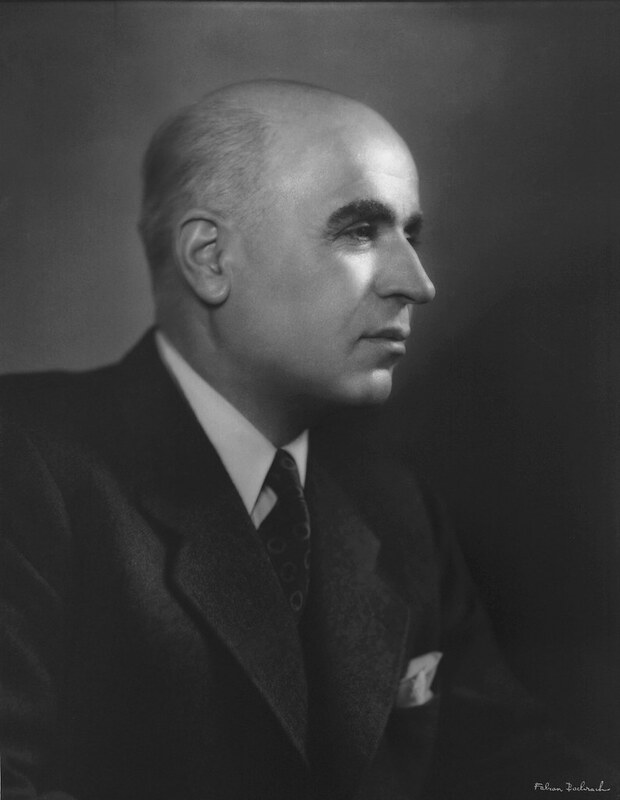 “My dad was born on Jan. 6th, 1937, and passed away on Jun 20th on the Feast of the Immaculate Heart of Mary. His full name is Jaime Reyes Diaz; born in Saenz Pena, Chaco Argentina. He married Maria Ines Aguero on June 8, 1961. Children: Claudia Zambon, Annabelle Diaz and Bill Diaz. Grandchildren: Nicholas Lalli, Andres Diaz, Amanda, Clara and Felix Tonconogy, Rocio Belen Diaz, Bryana Diaz, Steven, Anne Marie and Michael Zambon. 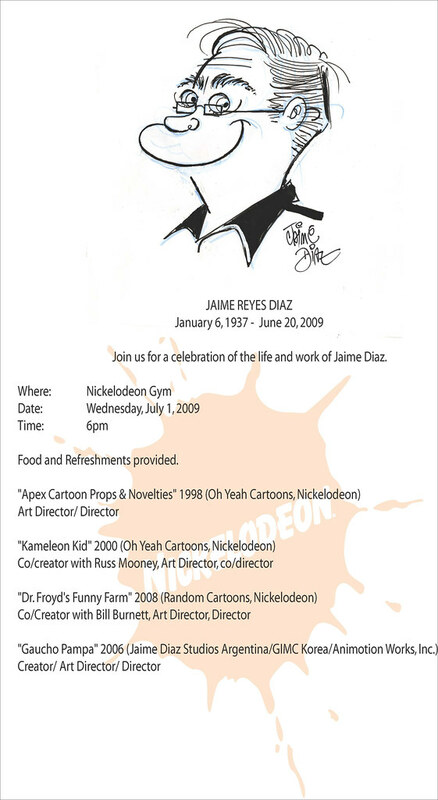 As you can tell by looking over his incredible resume on imdb, Jaime was an active and passionate part of the cartoon industry for over 40 years, from Hong Kong Phooey to Duckman. What a list can’t tell you is what a sweet, wonderful guy he was, with a completely puckish sense of humor. And talented, way talented. In addition to working on a lot of our series over the years, Jaime created shorts for Frederator; an Oh Yeah! cartoon with Russ Mooney, and a Random! 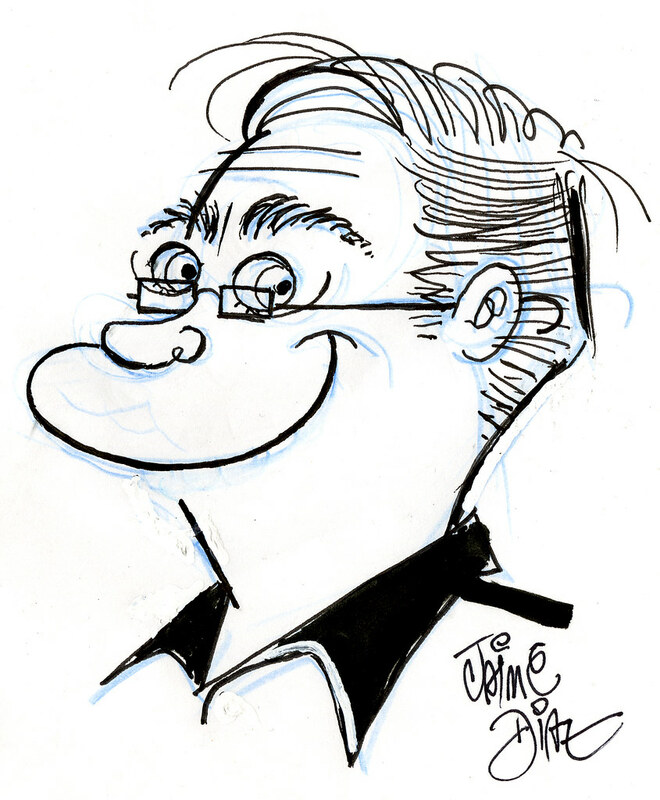 cartoon with Bill Burnett. Gaucho Pampa by Jaime Diaz from fredseibert on Vimeo. We were introduced by his close friend and my long, close colleague, Larry Huber, who writes this moving tribute at his blog. He also produced Jaime’s cartoon, Gaucho Pampa (above), which was screened at the Taiwan International Film Festival. Adios Jaime, we’ll miss you. James Proimos in the house. 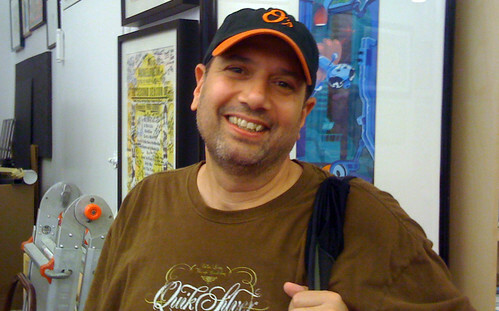 I met author/artist James Proimos when Frederator didn’t get a chance to make Generation O! as an Oh Yeah! Cartoons short. He came by the other day to show us what he’s been up to. Shorts for Nickelodeon, picture books, young adult novels, James is a machine. Gary Greenblatt in the house. Gary Greenblatt and I worked together at Sonicnet.com and the MTVi Group back in the day. So, I was happy to see him when he came in to show us his kids TV project “Sammy the Rocket,” based on stories he told during his son’s childhood. 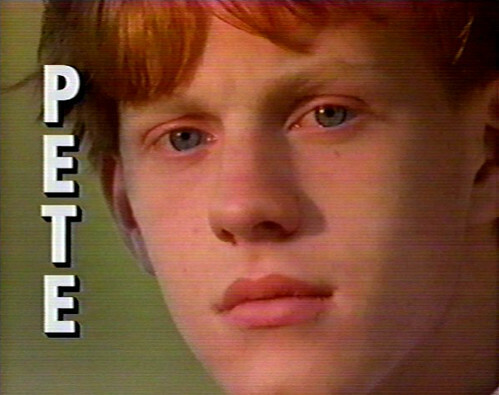 Bambi Meats Anime Hell from tohoscope on Vimeo. A video flier for the May 2009 Anime Hell shows. Inspired by Marv Newland’s Bambi Meets Godzilla. Will McRobb in the house. The three of us worked together for years in the formative years of Nickelodeon and Nick-at-Nite. And, as I told Will today, the afternoon he walked in the office with the original one minute TAOP&P script he changed my life; Will unleashed a thought in my head that allowed me to move out of television promotion into film production. Thanks Will!